Opposition party presidential candidate Edward Lowassa, right, speaks to the media at a news conference in Dar es Salaam, Tanzania, Oct. 28, 2015. Main opposition candidate Edward Lowassa has rejected the results of Tanzania's presidential election, citing alleged fraud. Lowassa told reporters Wednesday in Dar es Salaam that results from the opposition coalition's tallying unit showed the opposition leading the vote count before police raided the unit Monday. There was no immediate comment from the ruling CCM party. The latest official results from Tanzania's election commission, released Wednesday evening, showed Lowassa, of the Chadema party, trailing CCM candidate John Magufuli 59 percent to 40 percent. The tally covered results from 184 out of 264 constituencies, or about 70 percent. Final presidential results are expected Thursday. Lowassa's rejection threw more uncertainty into an election disrupted by the annulment of the vote in Tanzania's Zanzibar region. Zanzibar's election commission said Wednesday that the results were nullified because of "gross violations" in the voting process. Jecha Salim, chairman of Zanzibar's election commission, said there was a need to hold fresh elections in the archipelago. 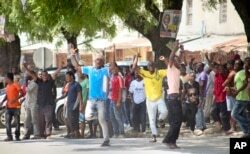 In this photo taken Monday, Oct. 26th, 2015 and made available Wednesday, Oct. 28th, 2015, youths supporting the opposition party dance and chant, predicting a win for their candidate, outside the Electoral Commission office in Stone Town, Zanzibar. Semiautonomous Zanzibar has its own government, but its votes count in the national presidential election. The nullification was likely to raise tension on Zanzibar, where a local opposition party claimed victory Monday before results were announced. Police fired tear gas to disperse crowds. “The only thing I know [is] that you are not supposed to declare yourself a winner before the electoral commission announces your name,” said George Otieno, a shopkeeper in Dar es Salaam. Otieno said he thought everyone needed to follow the law. While election observers have generally agreed that voting Sunday was organized and calm, a few street skirmishes have been reported around Dar es Salaam, allegedly by voters frustrated by delays in reporting of results. Generally, Tanzanians are patient, calm and "able to wait until things are done,” said Harold Sungusia, director of advocacy for the Legal and Human Rights Center in Tanzania. “But this time, those few instances [of scuffles] are kind of tarnishing our good name as a good country of people who can lead their things without violence." The Tanzania election commission chairman, Judge Damian Lubuva, expressed confidence Sunday the electoral process would be judged free and fair, despite reported problems at some polling stations. Appearing on a live VOA Swahili broadcast, Lubuva admitted there were some discrepancies at some polling stations, including lack of voting materials, but he said there would be no repeat voting exercises, except in constituencies where the process was postponed. Sunday's polls for president, parliament and local seats were expected to be the closest in Tanzanian history, with CCM facing its first major challenge in decades. The opposition coalition Ukawa, which includes Chadema, has already picked up at least nine parliamentary seats from ruling party members, including several Cabinet members. CCM has faced increasing pressure to speed up the country's development and deal with a persistently high poverty rate. President Jakaya Kikwete is stepping down after completing two five-year terms, as allowed by the constitution. Tanzania has a long history of presidents observing term limits, unlike many other African countries. VOA's Jill Craig contributed to this report. An elderly Tanzanian woman casts her vote in the presidential election at a polling station in Dar es Salaam, Tanzania, Oct. 25, 2015.